CORBYS aims to design a cognitive control architecture that allows inclusion of high-level cognitive control modules, a semantically-driven self-awareness module and cognitive framework for anticipation of human behavior. This objective concerns the development of a perception system for assessing the physical and mental state of the environment including humans. The perception system will include multimodal sensory feedback together with the BCI (Brain Computer Interface) detection of cognitive processes that are important for human motor control and learning. The research goals are aimed at improving robot-aided locomotion training by means of active ankle assistance, a better human-robot interaction, a more natural load distribution and more naturalistic gait movements. The project involves the design, control and testing of a powered exoskeleton prototype. The focus of his research is the design and the construction of the robot Probo and the implementation of intelligence with emotion recognition. The focus of his research is the design and the construction of the Probo robot and the implementation of inherent safe and compliance actuation. This thesis investigates design and control concepts of a compliant gait rehabilitation exoskeleton powered by Pleated Pneumatic Artificial Muscles (PPAMs). A knee exoskeleton, KNEXO, has been developed for the evaluation of these concepts in unimpaired and impaired subjects. In this research prototype the intrinsic compliance of the actuators is complemented with a dedicated assistive controller. The proposed combination of hardware and software compliance is beneficial for physical human-robot interaction (pHRI). This research was conducted in the framework of the ALTACRO project. See this page for more information. The goal of this research is the development and control of a proof-of-concept manipulator actuated by Pleated Pneumatic Artificial Muscles (PPAMs). Ergonomics and safety are the main objectives. Both the system and the operator will manipulate the load directly, without intermediary control elements such as joysticks. The load itself will be the interface between man and machine. 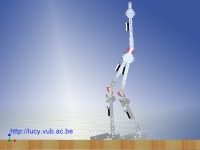 The goal of this project is to create a lightweight biped which is able to walk in a dynamical stable way. This robot is restricted to move only in the sagittal plane due to it�s one dimensional joints of which each of them are powered by an antagonistic pair of Pleated Pneumatic Artificial Muscles. An important issue will be how the stiffness of the joints has to change in order to have an energy-efficient robot. 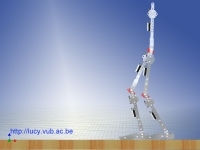 More information about this thesis can be found on the webpage of Lucy: bipedal walking robot. This thesis deals with compliant actuators and their use in energy efficient walking bipeds. Two types of actuators with adaptable compliance are discussed: PPAM (Pleated Pneumatic Artificial Muscles) and MACCEPA (Mechanically Adjustable Compliance and Controllable Equilibrium Position Actuator). The PPAM is a design made to overcome shortcomings associated with the existing types of pneumatic muscles. The compressibility of air makes them inherently compliant, which can be employed to reduce shocks. Their main advantages are the high power to weight ratio, the adaptable compliance when used in an antagonistic setup and the fact that they can be directly coupled to the joint without a gearing mechanism. A second design of the PPAM concept, which resulted in an extended life time, is used in the biped Lucy. This planar biped is actuated with 12 PPAM�s, giving the ability to control the six pin joints, both in equilibrium position and in compliance. The control strategy is based on the generation of trajectories for each joint out of the objective locomotion parameters. Ways to adapt the compliance in order to lower energy consumption are studied. The second type of compliant actuator, the MACCEPA, is entirely developed during this thesis, and patented. It is an electrical actuator of which the compliance and equilibrium position are fully independent and both are set by a dedicated servo motor. The angle-torque characteristic is quasi linear up to 60 degrees, which makes the MACCEPA comparable to a torsion spring, which allows to modify equilibrium position and spring constant online. Moreover, the concept can be implemented using standard off-the-shelf components. This actuator was used to build the biped Veronica. This is a planar biped, with 6 MACCEPA actuators, each powering one pin joint. The strategy of using the compliance for energy efficient walking, as elaborated in this PhD, is based on the concept of passive walkers. The compliant actuators are used to modify the natural frequencies of the limbs online, in order to achieve a smooth and stable walking motion. Since the developed passive walking robot is not limited to one walking speed, but can be controlled while still using natural motions, this concept is entitled Controlled Passive Walking. Efficient formulation of the equations of motion of multibody systems, based on canonical momenta (PDF-5Mb). For more information: Real time dynamic simulations. The goal of this research is the development of an efficient algorithm for the dynamic simulation of multibody systems. This is achieved by using a recursive formulation based on canonical momenta, resulting in a set of Hamiltonian equations. 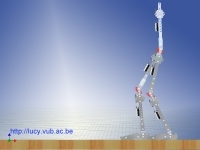 This thesis reports on the developments of the robot "Lucy", which is a planar walking biped actuated by pleated pneumatic artificial muscles. This type of artificial muscle is designed to overcome some shortcomings associated with existing types. The main purpose of the biped project is to evaluate the implementation of these muscles and to develop some specific control strategies related to legged locomotion with compliant joints. It is believed that pneumatic artificial muscles have some interesting characteristics which are beneficial towards actuation of legged locomotion. They have a high power to weight ratio and can be coupled directly without complex gearing mechanism. Due to the compressibility of air, a joint actuated with these pneumatic actuators shows a compliant behaviour, which can be positively employed to reduce shock effects. Moreover, joint compliance can be adapted while controlling position, when two muscles are positioned antagonistically. This compliance adaptation enhances the possibilities of exploitation of natural dynamics. The main control idea intended for "Lucy" is to combine exploitation of natural dynamics with joint trajectory control. A trajectory generator calculates joint trajectories which ensure dynamically stable walking, and the different joint controllers track the imposed trajectories while adapting the joint compliance, as such that the natural regimes correspond as much as possible to the reference trajectories. This can significantly reduce control effort and energy consumption, while continuously ensuring global dynamical stability. Currently the biped "Lucy" is assembled and most of its hardware components have been tested. 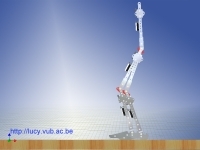 This thesis reports on the design and construction of the biped and on the first developments of the control architecture for "Lucy". So far the control design is focused on trajectory control and dynamic stability. A nonlinear tracking controller for a single and double support phase has been proposed in combination with a joint trajectory generator developed in the framework of a separate doctoral dissertation. A hybrid simulation model, combining the robot link dynamics with the muscle/valve thermodynamics, has been developed to evaluate the proposed control strategy, and to provide an elaborate tool for future research on exploitation of natural dynamics. The basic concepts of exploiting natural dynamics with the proposed pneumatic tracking system, is explained for a simplified model of a robot leg. Additionally, a description is given of a second generation muscle prototype of the pleated pneumatic artificial muscle, which is designed to increase its lifespan. A real-time joint trajectory generation strategy for dynamically balanced legged robots is proposed. This trajectory planner generates motion patterns based on two specific concepts, being the use of objective locomotion parameters, and exploiting the natural upper body dynamics by manipulating the angular momentum equation. Using objective locomotion parameters is an elegant way of characterizing steps or hops of a motion pattern. When values for these parameters are specified, such as step length, forward speed, etc., then the trajectory planner translates these goals into feasible joint trajectories, or in other words, into actuator commands. The trajectory planner uses the angular momentum equation to ensure that the generated polynomial joint trajectories inherently guarantee a high level of dynamical postural stability for the robot. In this work, postural stability is quantified by the distance of the Zero Moment Point to the boundaries of a stability region. The upper body of the robot, with its larger mass and inertia in comparison with the leg links, manifestly affects the position of the Zero Moment Point since generally large ankle torques are required to keep it upright. In this work, the planning method defines the trajectories of the leg links in such a way that the upper body motion is naturally steered, meaning that in theory no ankle torque would be required. To overcome possible external disturbances, a polynomial reference trajectory is established for the upper body motion, which mimics a natural trajectory. Consequently the required ankle torque is low, meaning that it does not cause the Zero Moment Point to move out of the predefined stability region. Specific trajectory generation strategies are developed for two different types of robots, being a hopping monopod and a walking biped. The main difference between these strategies is that for the hopping monopod a flight phase is present, while for the walking biped a double support phase has to be taken into consideration. Both robot models are assumed to be planar systems, moving in the sagittal plane. The effectiveness of the developed planning strategies is verified by a variety of computer simulations. One of the most interesting aspects of these methods is that they are based on fast converging iteration loops, requiring a limited number of elementary calculations only. The computation time needed for generating feasible trajectories is low, which makes the strategies useful for real-time application. This dissertation describes the development of a new kind of Pneumatic Artificial Muscle, named the Pleated PAM. Basically, PAMs are contractile device operated by pressurized gas. Their core element, the fluid chamber, is a deformable membrane, which is the reason of their low weight. Most of the existing types of PAMs use elastomeric materials for this and, hence, their deformation is based on material elongation. The Pleated PAM, however, deforms by rearranging its membrane. It uses a high stiffness membrane that is initially folded together and that is unfurled upon inflation. This leads to a strong reduction in energy losses with regard to the classical types and, hence, develops stronger forces and higher values of maximum contraction. A 10 cm long prototype, weighing only 60 g can pull 3500 N and contract to up to 41% of its full length. A revolute joint, powered by two antagonistically coupled muscles was built and its control was examined. It is able to generate torques in the range of 1 to 70 Nm. Thanks to a careful design, the non-linear systems position could be controlled by a linear PI-controller. Besides position control, the joints compliance or stiffness can be easily controlled by regulating the muscle gauge pressures.